The Sylvania C2 is a 2 watt arc lamp manufactured in a compact flat-top envelope. 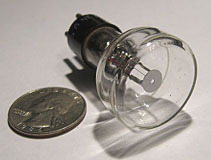 With a face diameter of 1 inch and a total length of 2.25 inches, this arc lamp is quite small, and is dwarfed by most other devices of its type. Although not much is known about this device, the C2 is likely a zirconia-based lamp, which contains an active element made from a slender length of zirconium oxide. A tiny bead of zirconium on the end of the rod serves as the active element. Some variants of this tube are marked with the part number C2/DC/S, while others only carry print for the C2 prefix. Sockets for these can be difficult to find, although some Honeywell Purple Peeper flame sensors make use of the same 3 pin base, and as such can be 'harvested' for a compatible socket if no other option is available. 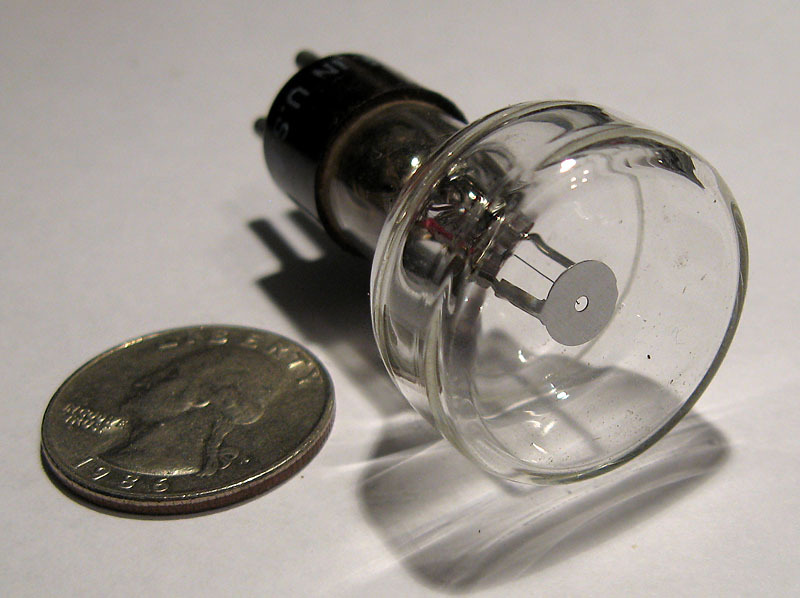 Sylvania C2 concentrated arc lamp, with coin for scale.